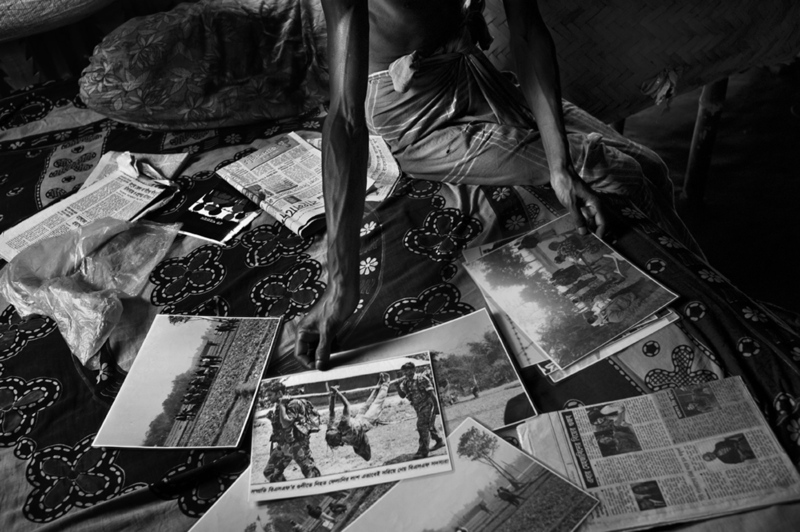 Bangladesh\nNour Islan, 45, father of Fellani, 14, who was shot on the border wall, is showing and describing some pictures taken the day after the murder of his daughter. Fellani was carried like an animal by the Indian Border Security Force to their compound.\n\n\nNour Islan, 45, moved with his wife to the Indian State of Assam, some 20 years ago. Their three children were born there. When their daughter, Fellani, turned 14, they settled a wedding with a young man who used to live in their home village in Bangladesh. Fellani and her father had to cross the border to meet the man and arrange the wedding ceremony. One night, as they were crossing over the double barbed wire fence with a ladder, Fellani was shot and fell upside down with the legs and clothes hooked on the fence. The Indian Border Security Force (BSF) soldiers urged Nour not to move, neither to escape or to help her wounded daughter. Fellani was shouting and crying. They forced him to look at ther daughter die. It lasted for 20 minutes. The father had to run away and the body stood there until the next day. Some villagers called the BSF and a journalist got the news that something happened. He took some pictures that were published in India and in Bangladesh newspapers.\n\nThat "Fellani's case" forced the Banglasdesh gov. to ask the Indian gov. to set up and investigation. Indian soldiers were removed to another region and still work as BSF. \nThe body was braugth back to the father two days later and the press was invited by both authorities. That was a farce.\nThe bangladesh press organized a fundraising to help the faamily and they got enough money to open a small shop in their village and to build a new house. All kind of authorities wanted to be involved into the Fellani's family recovery.\n\nRight after the press coverage, Nour asked her wife and daughters to reach Bangladesh. India offered them visas to "help". He was afraid to go back to India and thought it was not safe for his family to stay in Assam.\n\nEven if they got quite a lot of financial help, they consider that justice hasn't been done.